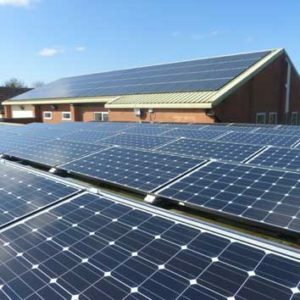 2012: 92 panels (23KWp) on the main SE facing clubhouse roof, attracting the original high Feed in Tariff (FiT) from Government, guaranteed for 25 years, just 2 weeks before the government reduced the FiTs substantially. 2014: 48 panels (12KWp) on the flat Scout Hall roof. 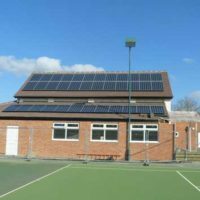 2015: 36 panels (9KWp) on the old squash court and tennis shelter roofs. In 2015 the total collection of 176 installed panels generated 91% of our consumption in 2015. Now that energy saving LED lights have been installed in 2016 in all the major rooms and corridors they have reduced our consumption considerably, so we are on course in 2017 to generate 100% of our consumption in 2017. As we generate during the day and our heaviest consumption is for lighting in the evenings, we typically export about two thirds of our generation at about 4p per KWh during the day and buy it back in the evenings at about 12p per KWh. As of July 2017, the 176 solar panels, now installed on the various roofs at SiD, have already generated 170,000KWh or 170 Megawatt Hours of electricity since February 2012. In the process they have already saved nearly 100 tonnes of Carbon Dioxide and we aspire to be effectively self sufficient for electricity in 2017 as we have substantially reduced our demand (with LED lighting) by hoping to generate at least as much electricity as we consume overall. We still need to be connected to the grid to make up the discrepancies between night and day and different seasons. 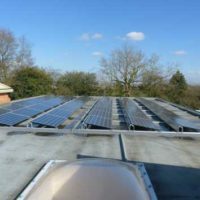 The Feed in Tariff subsidy from the Government, which is different for each phase of installation, helps SiD with maintenance costs and enables us to keep membership costs low. 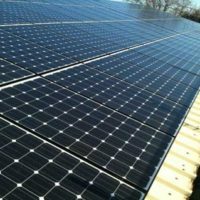 The solar panels have a projected lifespan of 20 to 25 years when the Government Feed in Tariff subsidies will also run out. However we believe that they will continue to perform well beyond this limit and will continue to provide free electricity in decades to come, when it is likely that energy prices will have risen significantly.